Well there it is in all of its procrastinated glory. I have even more unpainted figures for the Empire, but this is the army that I will be painting up according to the list that I drew up in my last installment. As you can see my force is in various stages of paint, from bare plastic/metal all the way up to being done. Over the last two years my tournament WFB armies have been pretty much retired. They would come out from time to time to play friends or help folks out in tuning their forces up, but I have really not had much of an interest in playing tournament games with them. Mind you some of this is due to some absolutely horrendous sportsmanship at the first WFB ‘ard Boyz. Well, Minus 67 has talked me into pulling my oldest army out of retirement, which is now 20 years old. 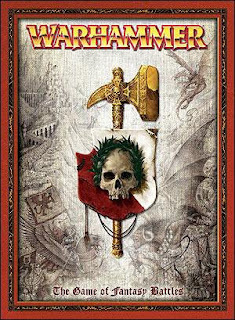 It is the one army I own that has the best chance of being competitive in the Daemon/Vampire dominated tournament scene, and one of the few armies that consistently shows up in the top ten rankings. That army is the Empire. My Empire army is a multi-generational army that was started on the tail end of 3rd start of 4th edition. Its main core of troops was initially built using the figures found in the GW-Milton Bradley Game called Battlemaster. 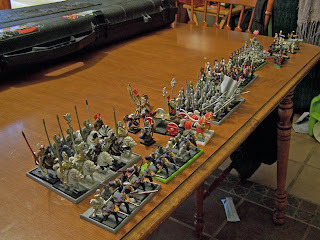 Many of those figures are still in my army, and yes they are absolutely tournament legal because they were made by GW. In 6th edition my army got its first real face lift with the figures that came out with the boxed set. Then in 7th edition, after the recent army book, I got the battalion box with the new style troops. I’m sure that by now many of you are wondering what all of this rambling is about and I assure you that I have a point. 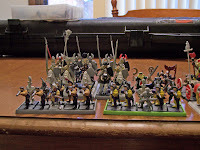 I’m going to write a series of hobby articles revolving around rehabilitating this old army for tournament play. I will also discuss some of my thought processes behind unit selection and tactics. Overall, I will be focusing more on the hobby aspect of all of this because that is what I enjoy the most, and it will give me a framework for the hobby articles I have thought about writing. I’ve designed a preliminary army. The build had a few main goals. They were: 1. Use what I have. 2. Make something fun to play and play against. 3. Make sure it has a chance to perform well. 4. Leave room for improvement. With that in mind I designed the following list. It is far from perfect, but it looks interesting and should put up a decent fight. The goal with this build is for the big units to act as meat shields for the casters. The Arch Lector is for general beat down, and I think it is pretty self-evident what the shooters are for. I realize that I spammed my artillery and casters, but I think that is a small matter. My greatest strength is guessing range, and I have enjoyed a lot of success with the big guns. Nothing brings a wider smile to my face than when my opponent walks into the mouth of the Hellblaster, or when my opponent thinks my ranges are off only to find that they have been hit by three cannons and a mortar. I will be looking at ways to add a Steam Tank into this army. I may also look at some alternative builds, but for now it looks like I have a good starting point. In my next installment I will face my shame publicly by producing the Portrait of Shame, or as I call it, “What I should’ve finished painting ages ago.” I will examine what exactly I will need to do to get this force fully painted and on the table. I will discuss how I will plan this all out, and I will look at what will need to get its paint stripped and what can just remain as is. All right readers your turn! Have at my build. Also let me know what major army plans you are looking at for the 2010-2011 Tournament Season. One of my favorite mediums for applying to the base of a figure is Vallejo Course Pumice. This stuff is pumice sand in a suspension of acrylic resin, which looks like a sandy paste. When it is dry it has a rough sandy texture to it. This stuff has some utility beyond basing, which is why I love using it so much. I utilize this stuff just as one would use sand and PVA/white glue. The main difference is that when the pumice is dry it is much harder and I do not have the flaking problem that one may get with sand. I also have found that I can add bits pushed down into the pumice. When I do this the pumice effectively glues the bit down to the base. The reason I have moved to using this is that any gap in the slotta base is easily and quickly covered over by the pumice. 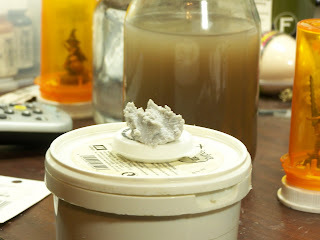 When I use the Vallejo Pumice I start by guessing at a portion I will need, and I will take out that portion from the tub and place on an old bottle cap or jar lid. I transfer what I need out of the tub so I do not prematurely dry out what is left in the tub, which is also a useful tip when working with premixed spackle. Once I have my working stock, I begin applying the pumice to the base with an old #11 X-Acto blade. (Important safety tip: when using old hobby blades for non-cutting projects be careful because they are dull the cuts they can make to you are worse.) I start working from the inside of the base outwards, and I work with a wet blade. A wet blade is a blade that has been dipped in water, and is useful because it will smooth the surface of the pumice. Once the pumice is applied to the entire base there are a few directions to go. The most obvious is to let the pumice dry and treat it like sand on a base. This works just fine and is most useful when painting armies. However, I like getting outside of the box and found that this pumice will hold bits on to the base like glue. What I have done is applied bits from my bits box, talus, or ballast to bases to add some visual interest. At the beginning of this article, I wrote about the utility of this product. One of my favorite aspects about the Vallejo pumice is that it adds some actual weight to a base. It doesn’t add enough weight to counter balance off center metal models, but it works perfect for plastic figures. My other use for this product is on vehicles. I have found it works great for modeling mud build up on tracks, track guards, and tires. There are some who will argue that sand works just as well, or that the $12(US) price tag is a bit much. However, I have based close to 4 dozen figures and still have more than half a tub left. Also when you are spending $15-$60(US) for single models the price consideration becomes negligible. Overall I like this stuff and recommend that everyone give it a try. Before I close out this article I thought I would share a picture of my finished witch figure from my last article. Enjoy! For those of you who have used the Vallejo Course Pumice tell us about your experience with it. Also feel free to post up your ideas with how you would use this stuff. Up until recently I have shied away from using black as main color on my figures (my Ravenwing being the exception of course). I was dissatisfied with how black looked. It either looked overly grey or that I had made a pathetic attempt at highlighting. After a lot of internet searching and discussion with my professional painting friends, here is what I leaned. Most of us who paint on an intermediate level understand the idea behind shadow, base color, and highlight. GW’s paints are designed to capitalize on this idea as are the figure paints of other paint companies. This subject alone can spawn pages of discussion on color theory and paint mixing. On a basic level the idea is about properly rendering color in three dimensions through using rough proportions of 25% of the painted area being a shadow tone, 50% base color, and 25% highlight. I admit those proportions are terribly scientific and not representative of a painting style. However, those proportions are helpful when thinking about painting black. Black’s shadow and base color is black, which means once you have applied a solid layer of black all you will be doing is bringing up the highlights. This can be quickly observed on any model painted by GW’s Heavy Metal painters, and is obvious on chaos warriors or marines in black power armor. The next concept in painting black is that black isn’t really black, at least not on cloth. Black is achieved in cloth through mixing dyes. This can be most easily observed in men’s dress socks. The color of black on the sock may be brown, blue, red, green, violet, and rarely grey. This knowledge can help us paint our highlights naturally. Armed with these two concepts, we turn to color selection. Many painters, including myself at one point, will highlight black through the additive process. This means that we start with black and build our highlights by adding white to the mix. This is an acceptable way to highlight black, but I began to notice on my figures that these grayscale highlights looked flat and lacked life. This is when I discovered the paint color “Payne’s Grey”. This wonderful near black color can be mixed using black, blue, and a dark brown. Alternatively you can get this pre-mixed. GW’s version is Necron Abyss, which is not as near black as I would like, but could easily be made closer by adding Chaos Black to it. Reaper Miniatures makes a color called Blue Liner that I feel is spot on, and it is what I use. I start by applying my first highlight of pure Blue Liner where I want the highlights to start and paint towards the brightest point of the highlight. After this is done I will start adding an off-white color to the mix and repeat. It is important to note that I add these highlights where the paint is thinned about 50/50 with water, and I add very little white at a time because white can quickly lighten up the color, which can spoil some of your transitions. It is important to note that using an off-white color is preferred. I suggest this because pure white can bring up the color too fast, and make your work look chalky. 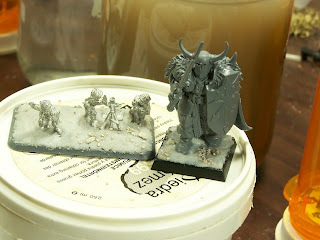 If you’re using GW colors I would suggest for your off-white using Bleached Bone, Dheneb Stone, or Astranomicon Grey mixed with some Skull White. I use a set of three off-white colors from Reaper. They are Linen White, Leather White, and Ghost White. 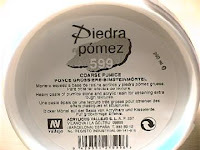 Using any of these off-white colors will produce some really great effects when used with Payne’s Gray. 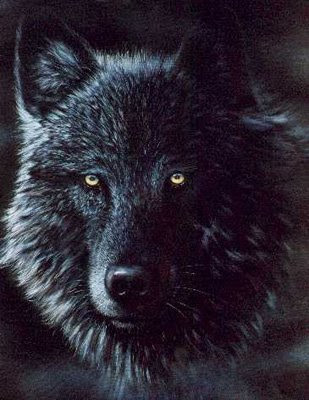 The wolf that used in my opening image uses a lot of these not black concepts and when you look at it you begin to see that working outside of grayscale gives the wolf's pelt depth and yet it still looks black. How do you highlight black? Have you used these colors before? Tell us how these concepts work for you.